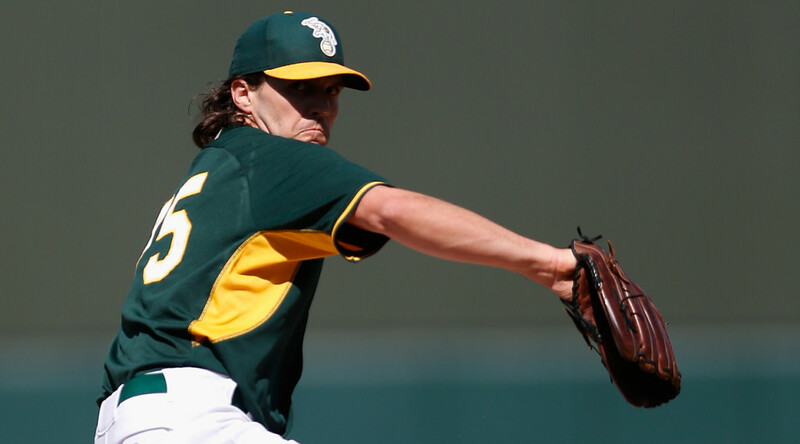 Phoenix, Arizona – Sonny Gray threw the first four innings and gave up both runs while Barry Zito threw the final four. Zito retired 11 of the 12 men he faced. The one hit he did give up was erased by a double play. Zito, who is attempting a comeback after a full year off from baseball, threw four scoreless innings for a save as the Oakland Athletics beat the Milwaukee Brewers split squad 5-2 in Maryvale Park on Sunday. Brewers Ryan Braun is 0 for 10 in Cactus League Play. Braun had offseason thumb surgery and missed the last three games with the Flu. The 36-year-old Zito , the 2002 AL Cy Young Award winner, struck out Bobby Crocker to end the ball game. Zito received a standing ovation from A’s faithful. The A’s have deep competition for their starting pitchers. Zito could be playing for a spot on another team. Zito: “I don’t think about things like that,” he said. “I have an agent. I’ve got an A’s uni on right now, I’ve just got to stay in the moment moment, give it my all to the team every time out, ” Zito added. Billy Burns continued on his hot streak improving his batting average to .441 with two more hits against the Brewers. Zito had his famous curve going on Sunday, as catcher Luke Carlin was the first to attest. Gray gave up two runs, but it was still enough to get the win. He went mostly with the fastball. Gray was a little predictable, yet it was good enough to be effective when he needed it. He gave up a run in the second and had men in scoring position but was able to pitched out of it. Athletics: Oakland is hoping OF Coco Crisp (right elbow) will be able to return to the lineup Tuesday when the A’s play San Diego in Mesa. 1B Ike Davis (back) could also be ready then or soon after. Bob Melvin said he is “more encouraged” than ever that Josh Reddick will be ready to be in right field for opening day on April 6th. Reddick, expected to miss four to six weeks after suffering an oblique injury just after Cactus League play started. Jarrod Parker will throw 30 pitches against live hitters Wednesday. To simulate a gamelike feel, Parker will throw 15 pitches, sit for a few minutes, then throw 15 more. The A’s made their first roster cuts. Right-handers Arnold Leon and Chad Smith and left-hander Eury De La Rosa were optioned to Triple-A Nashville. Right-hander Raul Alcantara, recovering from Tommy John surgery, was optioned to Double-A Midland. Right-handers Matt Buschmann and Angel Castro, left-handers Jim Fuller and Rudy Owens, catcher Bruce Maxwell and infielders Alden Carrithers and Niuman Romero were reassigned to minor league camp. Athletics: Oakland will face RHP Zack Greinke and the Los Angeles Dodgers at Camelback Ranch on Monday. RHP Kendall Graveman continues his quest for a spot in the rotation. Brewers: Milwaukee gets a day off on Monday. RHP Matt Garza will pitch against RHP James Shields and the Padres in Peoria on Tuesday.